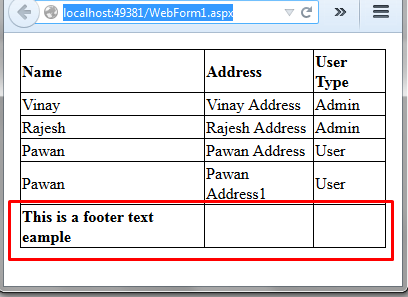 This article will show you how you can merge footer or apply columnspan to footer of gridview in asp.net using c#.net. In this we will display footer message in a single row of gridview footer in a single row. So for this article first we will create a new asp.net application and add the below code in the page. In above code I have use itemtemplate to bind the gridview fields and used label control to display the value using Eval. Now check the code to bind and display no of pages. SqlConnection con = new SqlConnection(System.Configuration. On above code I have used a function to bind the data. Now I have I have added the. 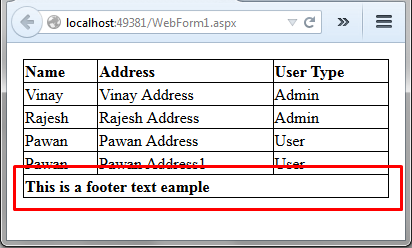 Now check the below code to merge the footer of the gridview. In above code I have validated when the footer row is appearing. Now I have applied loop to remove the extra columns to display only one cell in footer. Now for merging the footer cell ColumnSpan value have been applied. Now check the normal output without merging footer.